暂且将Use Mult-Byte Chracter Set称之为宽字节字符模式,而Use Unicode Charecter Set称之为Unicode编码模式. An LPTSTR pointer to the object’s (null-terminated) character buffer. The minimum size of the character buffer in characters. This value does not include space for a null terminator. 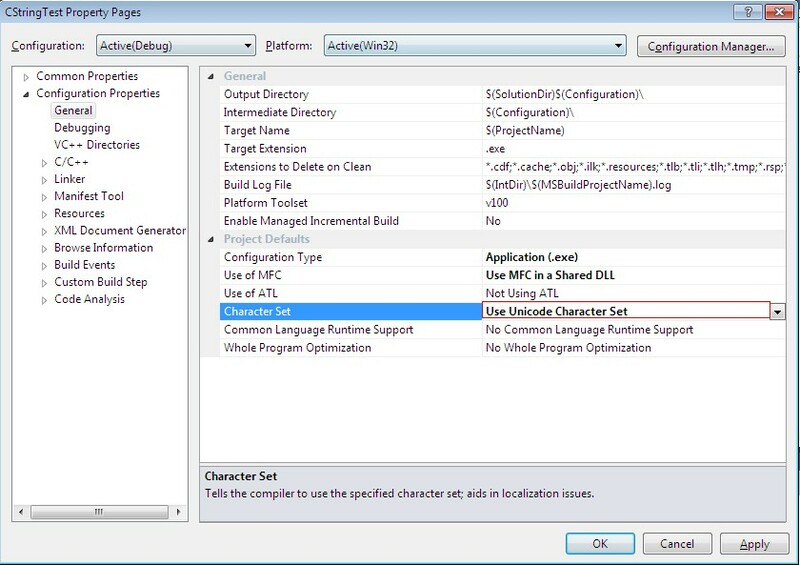 Returns a pointer to the internal character buffer for the CString object. The returned LPTSTR is not const and thus allows direct modification of CString contents. If you use the pointer returned by GetBuffer to change the string contents, you must call ReleaseBuffer before using any other CString member functions. The address returned by GetBuffer may not be valid after the call to ReleaseBuffer since additional CString operations may cause the CString buffer to be reallocated. The buffer will not be reallocated if you do not change the length of the CString. The buffer memory will be freed automatically when the CString object is destroyed. Note that if you keep track of the string length yourself, you should not append the terminating null character. You must, however, specify the final string length when you release the buffer with ReleaseBuffer. If you do append a terminating null character, you should pass –1 for the length to ReleaseBuffer and ReleaseBuffer will perform a strlen on the buffer to determine its length.